sup, homies! how is your school supplies shopping season going? get any good gelly roll pen colors? smell any pumpkin spice? hear any sufjan? i’ve had a week of major ups and giant downs, downs to the point where this emoji 😩 crept into my frequently used pile. lame! there was our broken oven, a hair coloring emergency, and two stubbed toes. which don't seem like a lot but my heavens i had no idea how boring it'd be to go for 2 1/2 days without an oven. but then! there was a fixed oven and new brunette hairs and lots of progress made on my yogurt book! holler. and eggboy’s beet fields are looking really extra good because he’s been working overtime since we’re going out of town to jaclyn’s wedding in a few days (!!). so when you pair all of those things with the fact that in my broken oven boredom i discovered some great riverdale superfan instagram accounts, we defo ended up with a net positive week. oh and i’m forgetting one of the best things that happened which was that the new wet hot american summer came out. i’ve watched the whole thing three times already. not word for word, i just have had it on continuously in the background while testing yogurt soup and yogurt cookies and it is the best soundtrack for cooking while the end of summer sun pours in. you know the one, right? we sang it every friday night at camp! 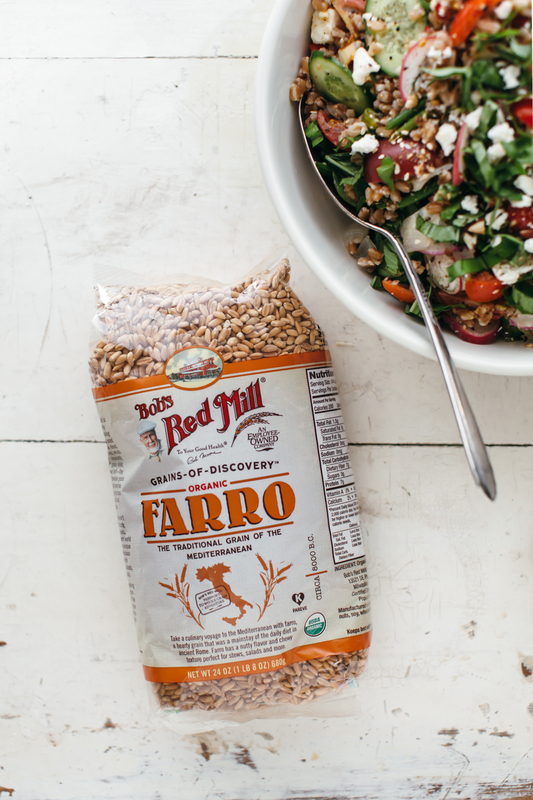 and so because our internet exists in a sea of grain bowls, my mind these days has been going straight to farro when i think about that song and then i get a craving for it. it's so chewy and hearty (and underrated?). (is it underrated? i have a hard time gauging these things living in a small town since i don’t think it’s on any menus here but i have this hunch that it’s maybe on every single menu in california? or maybe it was back in 2015? idk.) the thing is, it's good. i like that it's on the bigger bulkier end of the grain spectrum and that it chameleons itself onto whatever flavors you slap it with. it’s also great cold so you can make a bunch of it in advance and either send it out to the fields for a harvest lunch or keep a bunch in the fridge for when you spend the whole morning testing cake recipes and forget to eat anything of substance until it's too late to spend time making anything. oh and i was talking about pharaoh! the pharaoh song inspired me to want to add egyptian flavors to farro. so i toasted up some dukkah, sautéed a bunch of garlic and onions, and then headed outside to rip some mint and vegetables from the garden. our garden is in the calm before a very tomato-y storm right now since it is filled with zillions of green tomatoes that i just know are going to ripen all at the same time. luckily there have been a few early ripe ones. i also grabbed some basil and radishes, which are giant and probably overgrown, and then tossed everything together with tons of grilled lemon juice for a smokey caramelized acidic situation. 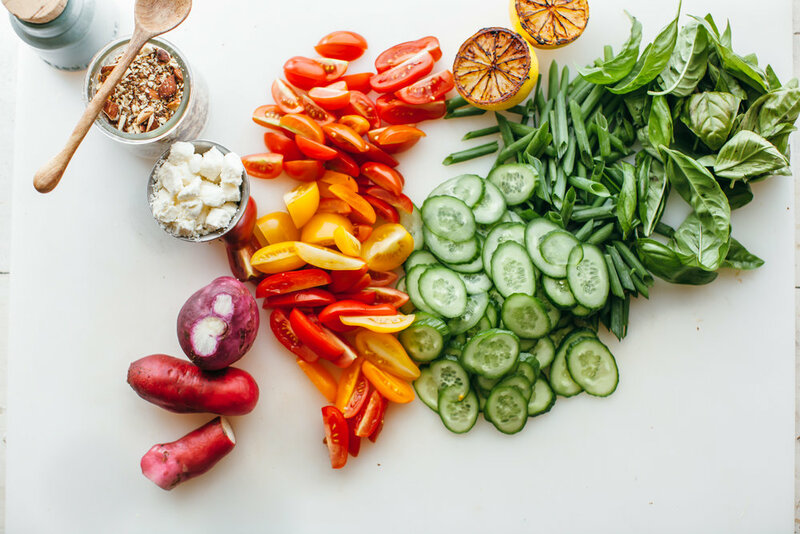 the result: a bright flavor-filled summery salad that packs some textural excitement, thanks to the dukkah, which functions as a savory crunchy sprinkle of sorts. 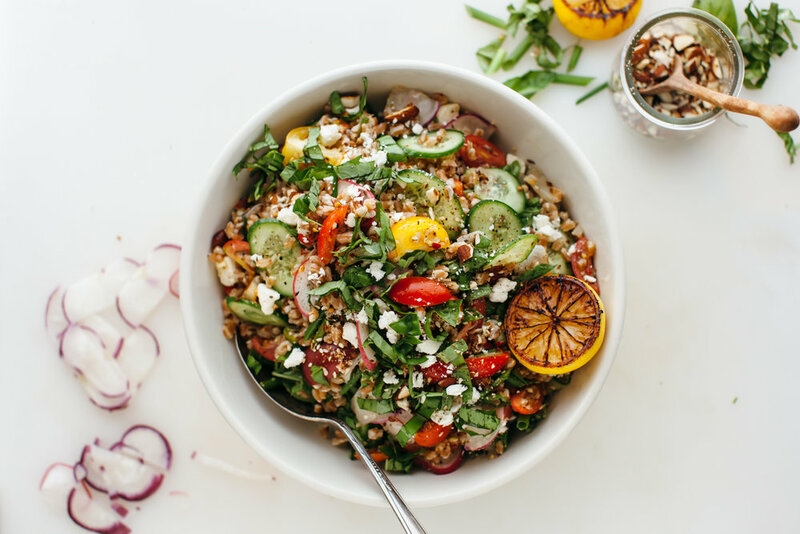 this salad doesn't have a formal dressing but between the olive oil that cooks the onions and garlic, the grilled lemon, the herbs, and the dukkah, you have all of the great makings of one, and you also have the protein from the farro and nuts which makes this thing a nice filling meal. can i call it pharaoh farro? every time i’ve made this now i think i’m going to have enough to keep in the fridge for at least a few days but then eggboy hides it all in his belly before i even have my seventh cup of coffee 🙄 so i guess that’s a good sign but as soon as more tomatoes ripen i should really make a double batch. i used bob's red mill farro for this! other than it tasting super good, i like it because the package has directions for boiling it. as simple as it is, i never remember cooking times for grains, so this package makes me one step closer to eliminating the need for getting that grain cooking time tattoo. in a large pot, combine the farro and 3 cups water. bring to a boil and then reduce heat and simmer for 30 minutes. drain excess water, season with salt, and set aside. 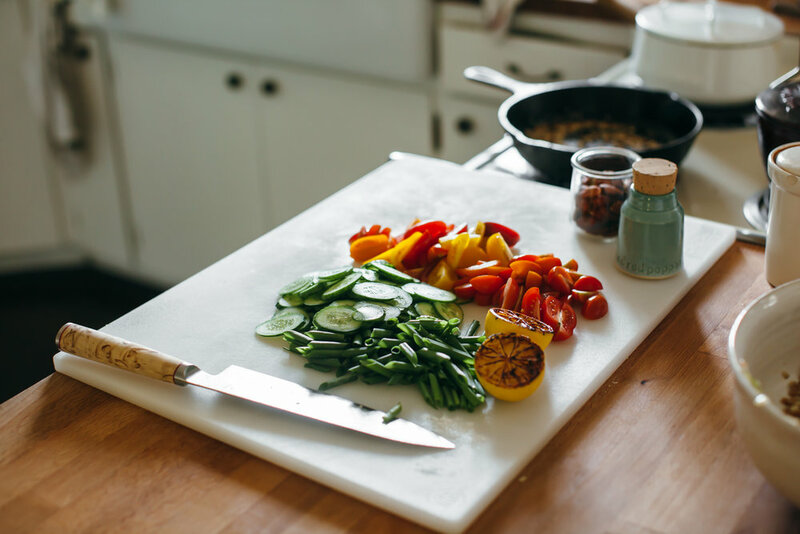 while the farro is cooking, heat the olive oil over medium heat in a skillet and add the onion, scallion whites, and a pinch of salt. cook, stirring, until soft, about 5 minutes, and then add the garlic and cook for 2 more minutes. pour the mixture into a heat safe bowl and set aside. wipe out the skillet and heat it over medium high heat. grill the lemon, flesh side down, until browned, and set it aside. make the dukkah: toast the cumin seeds and coriander seeds until fragrant and then crush in a mortal and pestle. mix with the chopped almonds, sesame seeds, and a pinch of salt. 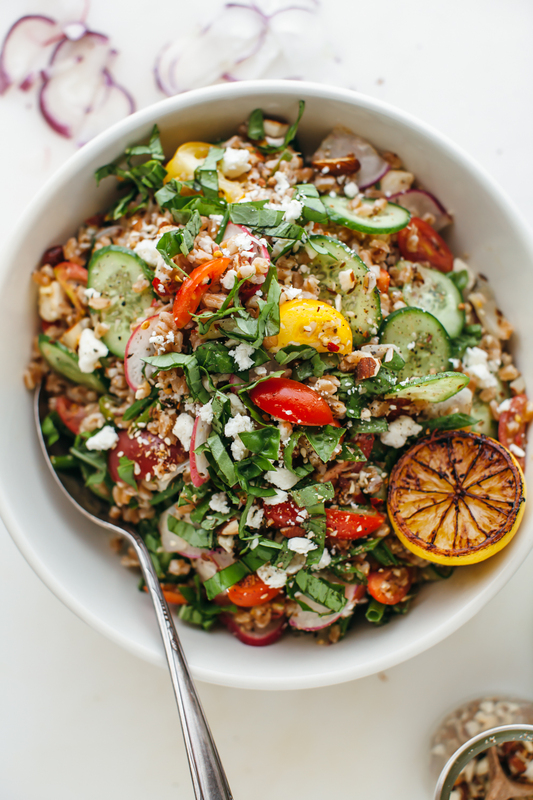 in a large bowl fold together the farro, cherry tomatoes, cucumbers, herbs (reserving some for serving), scallion greens, onion olive oil mixture, the juice from the grilled lemon, a few pinches of crushed red pepper, a bunch of turns of black pepper, the feta, if using, and half of the dukkah. taste and add more salt if needed. to serve, top with additional dukkah and herbs as desired. this can be eaten immediately or stored in the fridge and served cold or at room temp. enjoy!